The episode starts with devi of ved coming in Kailash. All gods do pranam to ved devi and ganesh comes. Ved devi says ganesh ji, I am safe only because of you and you give me back to brahma dev, I am thankful for that. devi of ved converts into the ved book of brahma dev and ganesh holds it and gives it to brahma dev. Brahma dve thanks ganesh and says ganesh, you have saved the world from durgamasura’s evil plans today. Indra dev and all gods say ganesh ji ki jai! 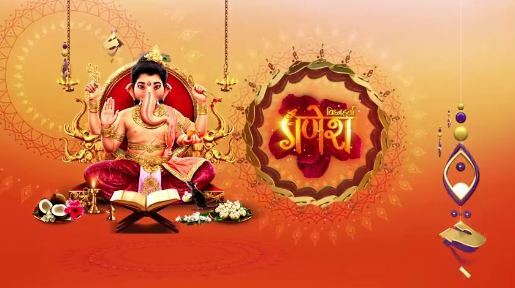 Brahma dev then says ganesh, from now on even you shall hold the ved book and it shall always remain in your hands as the symbol of your avatar also! You shall hold all knowledge and control the ved book. All gods praise ganesh and cheer his name. There durgamasura sees his lok as it is destroyed and he says no, everything I had is lost! everything has been destroyed. Durgamasura goes to the cave to ask guidance from mata kali. Durgamasura goes in the cave and he sees the fire in which mata resides and he hears her laughter. He says what kind of a mother are you? I lost everything and you are laughing? Mata kali says you fool, I told you and warned you before, I also guided you and told you the way to defeat ganesh but you couldn’t because dharma always wins. Durgamasura says please tell me mata, how can you do this to me? I prayed to you and have been your disciple. Mata says durgamasura I can give you one suggestion, even now change and become good. Durgamasura says what? You want me to become good? I am a demon. There all gods say, now durgamasura must be scared from what has happened, he will change. Ganesh says no, he will take revenge. Mata kali says then what do you want durgamasura? Durgamasura says mata, what do I do? Mata kali says you fool, get up and be a king. You are a king and do what a king should do right now. durgamasura thinks and says I understood, I will take revenge! Durgamasura calls a demon named akaal. Akaal comes and says maharaj, what should I do? Durgamasura says akaal, go to earth, bring drought upon the earth and make it barren, nothing should live there. Akaal goes. In swarg lok, all gods sit and indra dev says we have to fully regain our strength and for that we need the sacrifice of rishi’s in yagya’s. vishwakarma says yes devraj, now you gods pray together and send your powers on earth as you should do your duty as gods from now. all gods together pray and they send their powers, and resume their duties on earth. They wait for the sacrifices and strength given to them from the yagya’s. on earth, all rishi’s sit by the rivers and do yagya’s for the gods. The demon akaal comes on earth and he laughs and says I shall bring drought upon their earth, everything will dry up and no one will live. Akaal uses his powers and slowly all water from the earth, all oceans, seas, rivers, lakes and all water dries up. People start starving due to lack of food and hunger comes upon all living beings. Animals start to die, and forests burn! All trees go and the rains stop. People start dying from thirst and craving for water and food. As rishi’s do yagya, the head rishi sits and as he feels the heat he opens his eyes and sees around as the river has dried, the rishi tells everyone to stop. Everyone say what happened gurudev? Why did you make us stop the yagya? Rishi says there wont be any yagya now, the gods are not doing their duties, look around everyone. All rishi’s see around and they say yes, the gods are not doing their duties. In swarg lok, indra dev and everyone think by now we should have gotten the sacrifice. The gods appear in front of the rishi’s and say what happened? Why aren’t you all doing your duties? Rishi says you gods are not doing your duties and you are blaming us? look around, the earth has been ravaged by drought and people are dying of hunger and thirst, everything is dying. All gods see and are shocked. Ganesh meditates and he sees the state of earth and all people dying and living beings dying. Parvati sees and says why does ganesh look so sad and tensed? I should make food for him. parvati goes and brings modak for ganesh and she sees ganesh has tears from his eyes. Parvati says what happened ganesh why are you crying? Ganesh says mata, when my disciples and living beings are dying of hunger and thirst then how can I eat? I have to save everyone, the earth has been ravaged by drought because of durgamasura’s demon akaal. Precap: Parvati has a tear fall on earth and she takes a new form of a mata to save earth and bring back life and water on earth.